It’s nearly long weekend time! I don’t know about you but I am really looking forward to the much needed long weekend. I picked up this polish a while on sale at Dischem and I really loved it. I love that it is pretty neutral but still has a little something special about it. 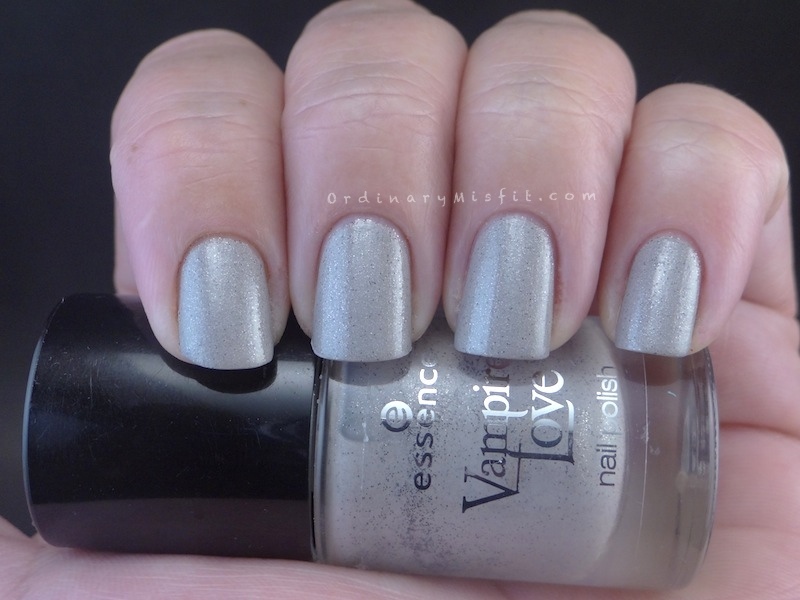 It is from a previous limited edition from Essence called Vampire’s Love. Let me show you how pretty. This is two coats of The Dawn is Broken. It is a cream coloured polished packed with darker (black?) and silver micro glitter / shimmer. I have seen some people don’t like it at all saying it looks like concrete but I really love it. It’s subtle while still being special. I couldn’t just leave it as is though so I decided to stamp over it. I tried out a different polish to stamp with. I used NYX matte polish in brown and Pueen15 and stamped the full design on every nail. My favourite is my ring finger. The design seems to be most clear on that nail. The NYX polish stamped really well but the minute I came near it with topcoat it turned into a mess. It looked very similar to a marbled effect. Not exactly the look I was going for. So I started over, used a different topcoat and same thing. I then tried this for a third time and decided to just leave the topcoat alone. 😉 I don’t know if maybe it just need more time to dry before topcoating. I didn’t want to risk it again to be honest but I will do a test run of this soon. What do you think of this polish? 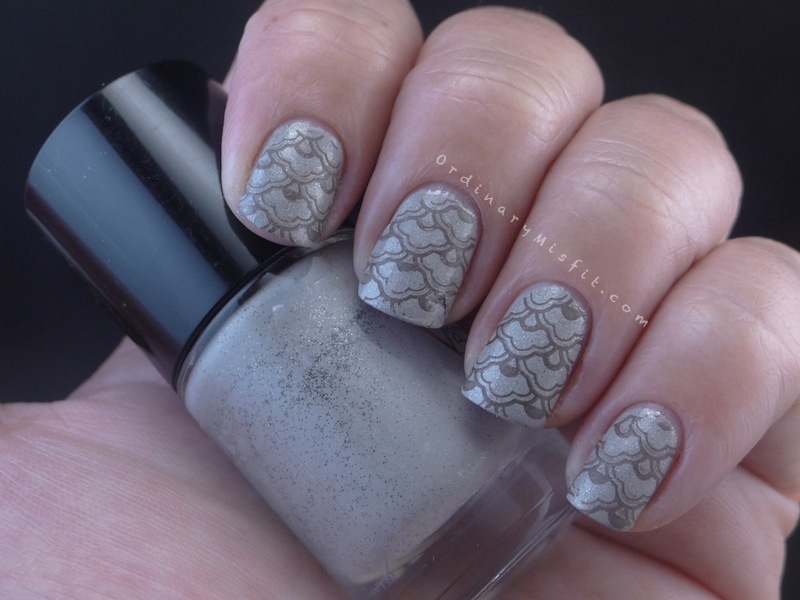 Do you also love the neutral stamping? Everyone knows I love bright colours but I was surprised by how much I liked this! It’s downhill to the weekend! Thank goodness! More stamping posts! This looks really gorgeous together. Wowi! Hahaha Thanks Lynette. Glad to see someone else likes the stamping as much as I do! I must say all your mani’s are great but this one is my FAVOURITE by far!! Thanks!! I agree. I was also thinking it looked like fabric. I really love it! I am seriously considering ordering this stamp kit! I love the designs! Really looks awesome – I could wear this for work. As you say neutral with a little something special. Love it! Wow! Thanks so much Charlene. I am so glad you love it. I love the combination and I think it is perfect for work! I don’t like the stamping, not because it’s ugly, it isn’t, but because I’ve loved that colour forever and ever and I just want to see it alone!!! Yes stamp every post! Swatching and stamping works mos well! Or if you want you can do a “how to achieve this stamp look without the stamp”? Hahaha you have too much faith in my ability. I could never do this without a stamp. You totes could! A stamping set that I want and a polish that I want?? Sies M! You are cruel! Lol I adore this! The swatch, the stamping, everything! I think the colours and the classy stamp design goes stunningly together!